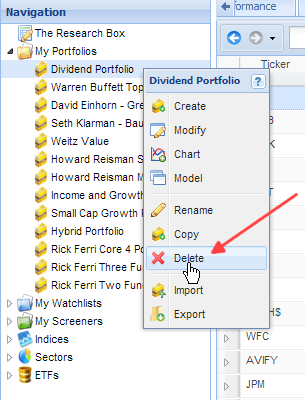 To delete a portfolio, right-click the portfolio in the Navigation panel and select ‘Delete’ from the drop-down menu. This action is permanent. To delete multiple portfolios, right-click the portfolio folder in the Navigation panel and select ‘Delete Portfolios…’ from the drop-down menu (for screenshots of this process, gohere. This action is permanent.